Your Cart Currently is currently empty. I just thought I’d let you know that the box arrived safe and well at it’s new UK home yesterday….I ‘killed’ with it this morning! I am so pleased with the box, it’s quality and what I can do using the unique method it uses (I just beamed from ear to ear when I saw the method!). A delightful effect, thank you so much for getting it to me! Hey Greg... Derek Kennedy here from Ft Worth Texas (Les Bartons friend). I just wanted to thank for a couple of things. First being a Magic Shop owner myself I know how hard it is to "Host" events (while you are open for business) like you did this past May for the Magic Collectors Weekend, so thanks to you and your staff for making it a really fun time!!! Also for going out of your way to help locate the Instructions for the Spirit Paintings!!! Now it makes sense. Again I really do appreciate it. This was only the 2nd time I had been to Abbotts, the first was 30 years ago for the 1985 Get Together. And that year I was lucky enough to have been part of Abb Dickson's "Kitchen Act". 30 years is a long time, I had just opened my Shop in February of 85 and I am not sure how I could get away long enough to drive up and back from Texas!! Being a long (longer than me) time shop owner you would understand that more than most would. But wow, things have change in the last 30 year...we are in a unique business, the Magic business is not quite what it once was. Anyway I enjoyed myself so much with being in Marshal and visiting Abbotts, (this past May) that I and my other half (Kathy) have registered for this years Get Together.....I figured that I had better not wait another 30 years before coming back!!! Again thanks for all and looking forward to a fun time in a couple of weeks!!! Greg, I've done business with your company since 1975. I always prefer your craftsmanship over your competitors in that time. You were able to take a worn out homemade mini zig-zag and build a professional one in it's place. I've always have had great reception to this prop which was why it was worn out to begin with. I wish you the same as you put it on the market. I have some other ideas that might sell for you so I'll try to get down some time to see you and maybe even have another prototype to play with. Thanks again for a great job and may this year be a blessing. Received the slates yesterday. Fantastic service, getting an out-of-stock item to me in record time. This is the first time I've come across and ordered from Abbott's website. However, when I got into magic some 45 years ago, Abbott's was basically the ONLY place for magic - I still remember the 1 1/2 inch thick catalog (or maybe I just remember it that way, as a youth). Anyway, I will reiterate. Fantastic service, getting an out-of-stock item to me in record time. Saved my New Years plans. Thanks so much. I got my Vapr yesterday and it is WAY more exciting than I anticipated. One of the best products I've ever purchased. I can't wait for my next show to plug it in and use it. I am also surprised how easy it really is to use. So many times, the promo videos make things look easier than they are but this is simple and well thought out. You have added to my list of blessings to count this Thanksgiving Day. Just got the Den-O-Zen and wow...what a nice job! It really looks great and if the paint scheme you did for me isn't now the standard for this trick...it should be. Again, thanks and nice job. Just received my Mail Bag and wanted to say GREAT JOB! The construction is top notch! Great quality and I couldn't be happier! Thanks Abbott's!! Hi Greg: I'm loving my new Mutilated Parasol that I bought during the Get-Together! Thanks to all of you at Abbott's for the excellent quality--what a great piece of magic! I have a library of over 4,000 books on magic and I feel qualified to state that it's simply the best Halloween resource of genuine Halloween magic secrets ever published...and you can quote me on that. I got this book in the mail last night and feel like I owe Abbotts some more money. You get a LOT of magic for your money here. Individually these tricks, illusions and effects would have cost you hundreds of dollars. Abbotts is using a print on demand service so you get a REAL BOOK, not some plastic comb binding other dealers use. I can't say enough good things about Dark Secrets, I hope Abbotts does more of these projects. At $25 this book could easily have sold for three times the price and still been a bargain! In a world where the "good stuff" is hidden in obscure pamphlets and magazines long forgotten, Dark Matter Secrets stands out as a real treasure. This book contains literally hundreds of usable pieces of magic you aren't likely to find on your own - all in one volume. The magic imps at Abbott's combed through their vaults in search of some of the best releases from their nearly 80 years in business, re-type set most of it, and put it in this beautiful volume. From close-up bizarre magic, to major stage illusions, it's all here. It's about time someone puts a QUALITY product on ink and paper for professionals and hobbyists alike. If "Halloween" and "spooky" is your thing, you are going to LOVE this book from Abbott's! Greg, Thanks for a wonderful compilation of great Abbott spook magic. It truly is a must for anyone interested in the history or performance of such material, and a perfect product to come out of an old black building with skeletons on the front! Hope all is well in Colon. Got my copy of Dark Matter Secrets on Monday (Ordered on Friday) What a trip down memory lane for me. I actually used the plans for the Burning Alive, Spider Girl and Headless Women back in the late 60's. It's a great book, thanks Greg Bordner. 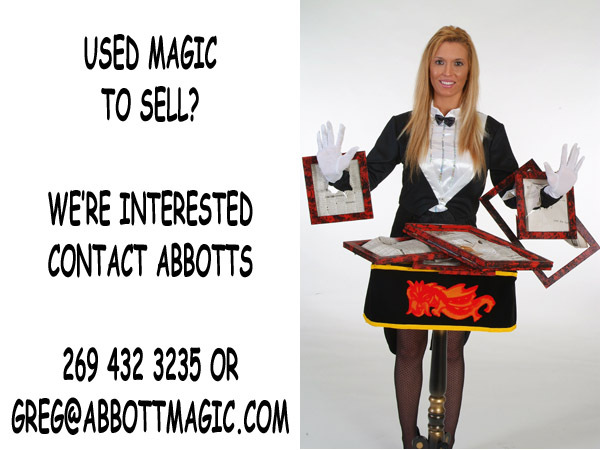 Follow Abbott Magic on Facebook - A Magic Timeline That Starts In 1934! Copyright © 1934-2017 Abbott Magic Company. All rights reserved.